This VHDL project is to implement a parameterized N-bit switch tail ring counter using VHDL. VHDL code for parameterized ring counter is presented in this project. It means that users can easily change the number of bits of the ring counter without modifying VHDL code inside the ring counter. There is a parameter N to define the number of bits of the ring counter, and when we want to change the number of bits, just change the parameter N and re-synthesize or simulate. The parameterized N-bit ring counter is implemented using both behavior and structural code and very easy for students to understand and develop. The structural VHDL code of the parameterized N-bit ring counter is implemented using Generate statement. The main component of the ring counter is D-Flip-Flop. architecture Behavioral of DFF is  --architecture of the circuit. begin  --"begin" statement for architecture. process(CLK,RESET) --process with sensitivity list. begin  --"begin" statment for the process. end process;  --end of process statement. The above DFF has one asynchronous reset pin which is to reset the state of the DFF at anytime. It means that it does not need to wait for the rising edge of the clock. Another version of the parameterized N-bit ring counter is the following structural VHDL code using GENERATE statement. A VHDL testbench is also provided to verify the operation of the above code. As we can see from the testbench, to change the number of bits of the ring counter, just modify the input parameter N and re-simulate. 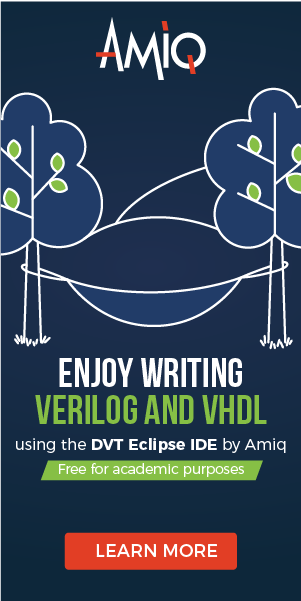 Both behavior and structural VHDL code are synthesizable. Below are the RTL Schematic for the behavioral modeling ring counter. The RTL Schematic is synthesized by Xilinx ISE. Programmable indicates a run-time functionality without having to re-compile first. For completeness: the presented ring-counter is a 'Johnson' type ring-counter. Thanks Josyb. I think your term is more accurate to describe what it means in this project. However, it is better to use the term "Parameterized". Let me change to Parameterized N-bit Ring counter. Copyright © 2016-2018 FPGA4student.com All Rights Reserved.